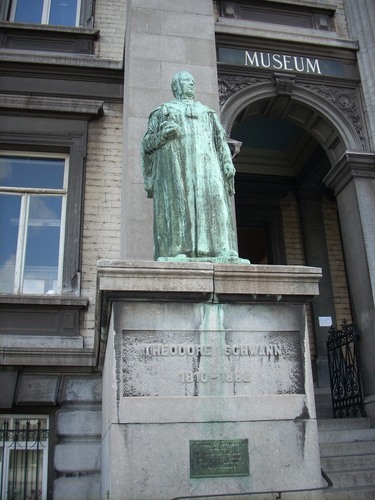 This bronze statue of Theodor Schwann, who teached in the University of Liege from 1848 on, stands at the left of the entrance staircase to the Zoological Institute (Quai Edouard van Beneden)1, beside the similar one erected to the memory of Edouard van Beneden. 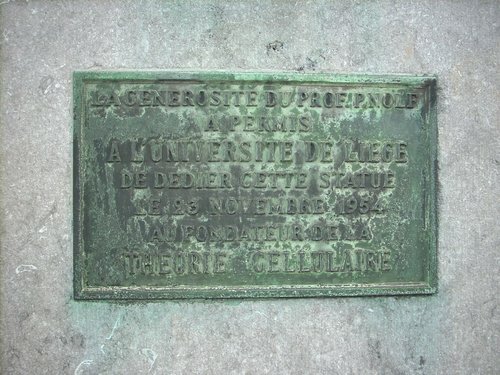 As it can be read on a bronze plaque on the basament of the statue: "LA GENEROSITE DU PROF.P.NOLF / A PERMIS / A L’UNIVERSITE DE LIEGE / DE DEDIER CETTE STATUE / LE 23 NOVEMBRE 1954 / AU FONDATEUR DE LA / THEORIE CELLULAIRE". 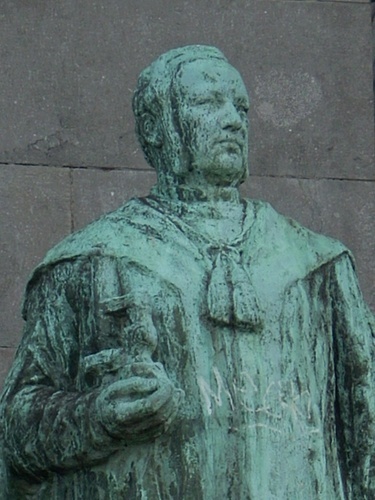 The statue was made in the same year 1954 by Alfred Courtiny (name of the artist and year are visible at the bottom of the statue). 1. The Institute hosts an Aquarium and the Maison de la Science. See the official website.